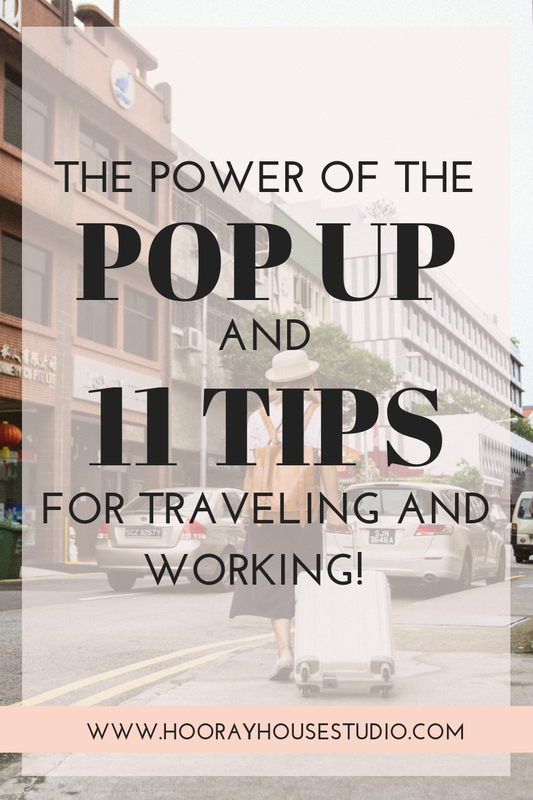 Power Of The Pop Up- Retail and Travel. Connecting with people in person without a long term commitment. Lower upfront costs and investments. Opportunity to network and collaborate with other business owners. Opportunity to introduce your products to a new audience. Time to observe and test foot traffic in a certain location. Pop up shops are a great alternative for a lot of online sellers, who still need to get out from behind their desk from time to time. This got me thinking about a conversation I have pretty regularly with plenty of client's about how they want to travel but don’t know how to juggle it with the demands of their business. Online sellers should know that they have a major advantage that brick and mortar shops simply don’t- the freedom to move, and not be tied to an unforgiving schedule. What’s more is that if you’re willing to cart some inventory in your luggage and plan vendor registristration in advance, you could set up a pop up shop literally anywhere you want to go! And if that doesn’t sound like a good time, you can work from your laptop or phone anywhere there’s a wifi connection. But that’s where my travel advice begins and ends, which is why I enlisted the help of my travel expert, Lilian! She is a travel agent, a mom, and someone who frequently works on the go. She knows how to grow and sustain her business while traveling and I just knew her advice would be the best for any shop owners who are looking to travel and still continue to work. As it turns out you can absolutely do both, and Lilian broke down her Top 11 Tips for Traveling and Working! Working from home is the best decision I’ve ever made. There are so many positives. The one I most love, though, is that I can travel anytime I want. As long I have Internet connection and a computer, I can work! In the Caribbean and Mexico, low season is the end of September, October and early November. Summer and winter are usually the most expensive traveling times to the Caribbean. You can find very low prices, though, if you travel in the Fall. But to Mexico there always good deals even during winter. January-April travel to the Caribbean and some parts of Mexico are high due to the “snow-birds” escaping the winter and all the resorts in sunny destinations are much more expensive...including (or especially) Florida. Avoid Summer and Holidays - families travel when schools are not in session. Europe’s low season is winter and Fall— if you are not skiing of course. March, April and October are great months to visit Europe, it’s still a little cool, and there are less tourists. Avoid May to early September, the peak season in Europe. Greece has been a very popular destination lately, but you can still spend a week there for less than 3k including flights from the east coast of US, during low season! USA territories in the Caribbean - You can fly to the beautiful islands of St Thomas or St John in the Virgin Islands for about $200. You don’t even need a passport if you’re an American Citizen, because these island are part of the US. The same goes for Puerto Rico. Did you know that a lot of people - who work from home - are moving to Puerto Rico? Apparently there are some huge tax savings, so they say. All-inclusive resorts are a great way to save money because all your meals, drinks and entertainment are included in the price. Some even include transfers to and from the airport! Most All-inclusives are in the Caribbean/Mexico. Reaching out to a travel agent is another way to save money. I’m not one of those “Old-fashioned” travel agents, I plan some awesome Honeymoons and vacations around the globe. And yes lots of people use our services! Because we travel a lot and are very familiar with the destinations , we play a roll of match-maker, matching you to a perfect destination/ hotel etc. We agents work with wholesalers that offer our clients better prices on resorts and international flights. I can put a package together for you in which you just need to first put a small deposit down ($200) and then the final balance is due 45 days prior your departure (90 days if it’s a cruise) this way you’ll have months to save for your trip. We can also help you decide when or where to go to best utilize your time and money depending on your budget. Avoid shopping for flights Friday-Monday. That’s when I’ve noticed the airlines prices go up, because most people shop on weekends. The prices go down to normal again by Tuesday, usually. If you’ve been shopping for flights on the same device for a few days, before you buy it, try doing a new search for the same flight under a New Private Window (to open a private window click on File then New Private Window in Safari) or in Incognito Mode in Chrome. Based on my experience, if I keep shopping for the same flights for a few days on my home computer I usually get the same price, but if I start the same search under a New Private Window, I usually get an updated lower price. Don’t ask me why, but I’ve noticed the difference in price- for the better. Also try shopping for 1 seat at a time, rather than 2 or more. Sometimes the airline still has 1 seat left for lowest price but if you try searching for 2 seats together you’ll get the higher price for both. But if you book them separately, you might get the one seat at the lowest price. It has happened to me! If it’s international check with me before booking to see if I have a contract with that flight, if I do, I’ll be able to offer a lower price. Start a Travel fund! You can do this either by opening a savings bank account exclusively for travel, or just find a box/piggy bank at home and start saving money every month or every paycheck. Try to put away what you can, $10 some weeks $50+ others... it adds up! Many couples do this while planning for their wedding/honeymoon. But, always put something away even if it’s only $5. Keep in mind, you’re not using this money to buy new shoes, it’s for travel only! With discipline, it works really well. Get a budget app and start cutting costs you don’t need. Things like coffee at Starbucks, dinner out, happy hour, mani & pedis, new shoes, cable tv, new outfit, another new outfit, and another, and- well, you get the idea. Some resorts offer different ways for guests attending your wedding to contribute to your honeymoon instead giving you plates or pots or pans. You can watch prices drop on certain airlines to specific destinations. In certain times of the year, you can fly to Paris or Iceland for $400 round trip! There are some low price airlines, like Spirit, Wow Air or Bee Airlines. Bee is a French airline and flies from the West Coast of the US. Wow Air is from Iceland and flies from the east coast to Europe. No one can beat their prices, and they fly to many awesome destinations. (Be careful with Iceland, everybody wants to go there now and while you can get a very inexpensive flight ...everything else is very expensive, food, car rental, tours and hotels.) Be aware: These airlines prices don’t include seats, luggage or meals- everything is purchased separately, but usually, it’s still the best deal. Cruises can be SUPER AFFORDABLE. If you book in advance, you can find prices as low as $250 per person, going to the Caribbean or Mexico in a cabin without a window. And the great thing about it is that includes all your meals and entertainment. The only problem with cruises is that they’re not very wifi friendly. If you need internet to work, it can get expensive (internet on cruise ships are extra and can be weak at times. There are lots of tour companies out there that are specially focused on millennials or other specific ages. You travel together with the same age group through Europe, visiting many countries in a very affordable way. If you use credit cards to make purchases for your business it’s a good idea to get one that gives you money back or miles that you can use to book free flights on any airline. Or applying for a credit card by an specific airline that you are thinking about using in the future. We fly to New York quite often so it was worth it to me to get the Jetblue cc, or another example... I was on this American Airlines flight and they had this fantastic offer, they were giving away 4k miles if you applied for it and spend certain amount within 3 months. I knew I wanted to go to Barcelona with my son and AA had the best price to Barcelona so I applied and I got 1 free ticket with the miles. Just make sure you research all your the options out there and pick the one works best for you. And also make sure to pay the cc bill every month, otherwise it doesn’t make sense. If you are a visual person, create a vision board of the destinations you want to visit and put somewhere you can see everyday. This will get you excited about saving for it. Write everything down, have a plan, list all the countries/cities you want to visit then shop for them once a week or once a month, write your findings down to compare. Make your goals tangible by writing them down. Having a plan is the way to go! Plan ahead! Follow me on Instagram or Facebook for travel inspiration and specials. Happy New Year! And Happy Travels!